Yeah, this is America (woo, ayy)"
The above lyrics are taken from Donald Glover's (aka Childish Gambino) single "This Is America", which was accompanied by a provocative music video that had everyone talking. A sly but unmistakable commentary on racial and sociopolitical tensions in America, it utilized painfully familiar violence to get across its message. As I sat in the theater for "Widows", this blistering film from Steve McQueen elicited the same feelings of Glover's hit single. On the surface, "Widows" is just your everyday heist movie. But it gradually reveals deeper layers which make it one of the most resonant films of the year. 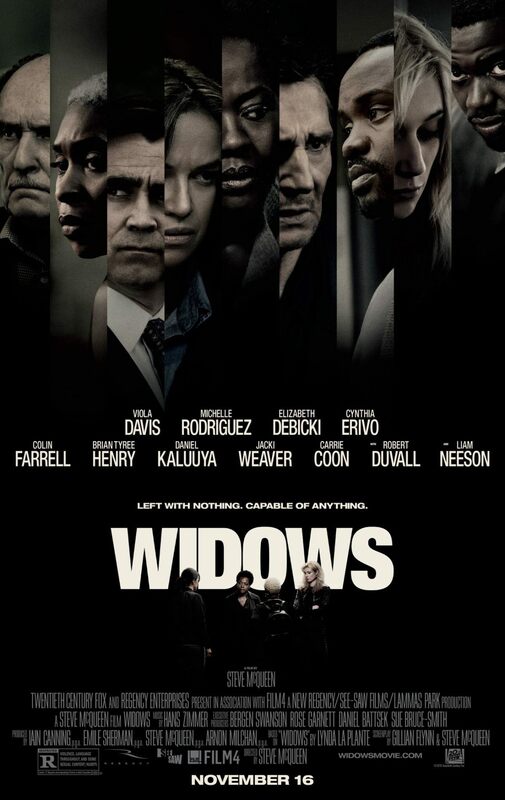 Adapted from British TV series of the same name, "Widows" gets a modern American update with a stellar ensemble cast. Set in Chicago, it begins with a heist gone wrong, as a man named Harry Rawlings (Liam Neeson) and his partners are set ablaze in their getaway vehicle with millions of dollars inside. As it turns out, that money belonged to a man named Jamal Manning (Brian Tyree Henry), who is currently in the midst of an election for alderman in his local South Side precinct. Requiring this money to mount a seemingly impossible campaign against a powerful political dynasty, Manning vows to get his money back by any means necessary. He therefore proceeds to give Rawlings' wife a deadline to repay the debt. But with her little property or money in her name, she is forced to band together with the other surviving widows of her husband's team to find a solution. They decide to attempt another dangerous heist, hoping to set themselves free from the mess their husbands left for them to clean up. Indeed, Veronica and her new partners Linda and Alice will quickly have to learn how to use guns and plan a robbery. But that payoff is only one piece of this story's puzzle. McQueen and screenwriter Gillian Flynn have a lot on their minds and they don't mince words, patiently bringing each character and their motivations into sharp focus. In the process, a damning portrait of interwoven issues surrounding race, ruthless capitalism, police brutality and deceptive politicians emerges. Four years ago, Flynn was denied her just rewards from the Academy for "Gone Girl", but hopefully they'll make up for it now with an overdue nod for Best Adapted Screenplay. This script may not reach the mind-blowing heights of "Gone Girl", but it's yet another brilliantly structured narrative which packs a real punch. And once again, she's paired with a director who is totally in sync with her cynical outlook of the patriarchy. There's no denying the feminist undertones to the film, which provides fuel for both the thought-provoking drama and exciting thriller elements. Seeing Veronica and Alice gradually come into their own as independent, powerful women is a true delight. Viola Davis will surely be in the running for Best Actress for this special performance which calls on all her considerable faculties as an actress. She is the action hero we deserve. To quote the film, she proves she has the "balls to pull it off." From its commanding star down to the ingenious camerawork, "Widows" truly delivers on all fronts. From its initial slow burn, the film eventually ignites into a heist scene so tense and nerve-wracking that I was literally on the edge of my seat. As such, it's a film that stays on your mind. And if there's any justice, Academy members will also remember it with a nomination for Best Picture. It certainly deserves it.